This all-time favorite is a great source of vitamins, minerals and fiber. An apple a day really does keep the doctor away! 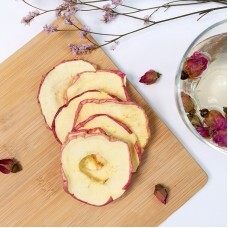 With our signature dried apples, you can easily enjoy this nutritious snack anywhere. 2. Cut the fruits into 3mm thick slices. 3. Soak apple slices into salt water to prevent them from browning. Dehydrate the fruits at 70°C for 9 hours.